Price is 20% below the initial Lego retail price, a € 2.00 discount! This comes down to 9.74 cent per brick. The Mining Team (60184) Lego set is available from the sites below. However, they do not offer delivery to your selected region. 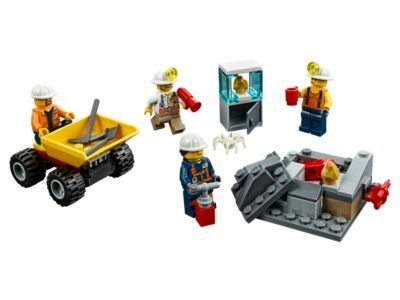 The Mining Team (60184) Lego set is no longer directly available from the sites below. However, 3rd party partners of these sites might still have the set available. Alternate description Blow up the rock pile and discover gold! Includes 4 miner minifigures and a spider figure. Features a dumper with tipping bed and space for a minifigure. Also includes a research station with space for golden nugget elements and a rock pile with breakaway elements, space for a dynamite stick element and golden nugget elements. Set the dynamite element on the rock pile and push the handle down to break it apart. Shovel the nuggets into the dumper to haul them back to camp. Accessory elements include 2 golden nugget elements, 1 dynamite stick element, demolition plunger, mug, shovel and a pickaxe. Dumper measures over 1” (4cm) high, 2” (6cm) long and 1” (5cm) wide. Rock pile measures over 1” (4cm) high, 2” (7cm) wide and 1” (5cm) deep. Research station measures over 1” (5cm) high, 1” (3cm) wide and under 1” (2cm) deep.